Thermal characterization was performed on a vapor compression heat pump using a novel, hybrid two phase loop design. Previous work on this technology has demonstrated its ability to provide passive phase separation and flow control based on capillary action. This provides high quality vapor to the compressor without relying on gravity-based phase separation or other active devices. This paper describes the subsequent work done to characterize evaporator performance under various startup scenarios, tilt angles, and heat loads. The use of a thermal expansion valve as a method to regulate operation was investigated. The effect of past history of use on startup behavior was also studied. Testing under various tilt angles showed evaporator performance to be affected by both adverse and favorable tilts for the given compressor. And depending on the distribution of liquid in the system upon startup, markedly different performance can result for the same system settings and heat loads. In this sense, the specific configuration and settings of the system are not mutually exclusive to a given performance. In general, four basic states of operation were identified which can result. It was also shown that active control of a thermal expansion valve may be used to recover from a non-optimal state. Recommendations for future work include optimization of the evaporator port geometry and wick structure to better mitigate against detrimental effects of compressor suction. The compressor itself was identified as an area in need of technology development to better match compression ratios, suction pressure, and throughput to the specific mission requirements. It is recommended that future prototypes consider the use of an actively controlled thermal expansion valve to mitigate against off-nominal states of operation. NASA initiatives for exploration of the moon and Mars will require advanced thermal control technologies to be fully realized. Accommodating the extreme environmental and power profile transients associated with a mission’s cruise and surface phases pose serious challenges to the thermal design. Examples include extended sorties and science outposts near the lunar equator as well as robotic missions to the moon and Mars using advanced nuclear power sources. Such missions are associated with large diurnal environment swings and power dissipations – begging for a thermal bus design for robustness. These future missions, such as those to the lunar equator where high sink temperatures exist, may benefit greatly or are enabled by the use of a medium/high-lift heat pump. To allow flexibility in radiator placement and orientation, it is necessary to elevate radiator temperatures by 50oC to 60oC over the equipment or payload temperature. And missions which require large radiator areas may save considerable mass, at the expense of input compressor power, by utilizing a heat pump. The vapor compression two phase hybrid loop (VC-HTPL) technology is a heat pump system developed by Advanced Cooling Technologies, Inc., (ACT) under a NASA Small Business Innovative Research Phase I contract. ACT is currently on contract for Phase II. The work described in this paper was performed on a prototype built after the Phase I contract. The objective being to further characterize and understand the VC-HTPL system and to feedback this experience into the Phase II design and build. The VC-HTPL system is a hybrid of a capillary and pumped system. The evaporator (also known as the heat exchanger or cold plate) which attaches to the equipment/payload to be cooled is an ACT proprietary design. It utilizes a wick structure to provide thin film evaporation off the wick surface. Menisci-based pumping is generated in this structure but is not necessarily the governing potential for flow due to the use of a downstream compressor. The pumped component of the loop is provided by a gear pump which is used to feed the evaporator with a constant flow of subcooled liquid. The other source of active pumping is from the compressor, which provides the larger source of flow potential. The maximum heat flux is limited by the capillary limit of the wick structure. It provides the passive phase separation and is able to provide 100% quality vapor to the compressor. Passive phase separation in the wick structure permits a simpler design over active phase separators or interstage heaters associated with active systems. It provides a very low thermal resistance interface between the heat source and working fluid due to thin film, liquid-vapor interface boiling. And the active pumping component of the design, namely the compressor work, provides a way to mitigate start-up issues associated with fully passive capillary systems. Figures 1 and 2 show a concept diagram and schematic of the VC-HTPL system, respectively. A gear pump was used to supply the evaporator in order to best accommodate off-nominal tests where insufficient subcooling exists and two-phase flow enters the pump. The compressor used was an off-the-shelf unit. 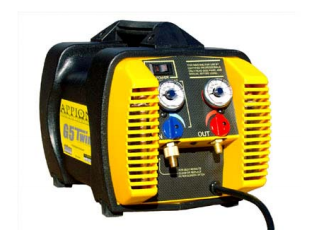 It is a model G5Twin by Appion, Inc., and is shown in Figure 3. It contains an integrated, air-cooled condenser. Although it is generally used for refrigerant recovery operations, it was chosen for this prototype system because it does not require any lubricant to be added to the working fluid – a key requirement when working with a capillary based evaporator. Note that the need for compressor technology development was recognized. For this study, the compressor was treated as a “black box” component which provided a reasonably constant level of performance in which to study trends involving other parameters. Figure 1. Concept of the VC-HTPL system. 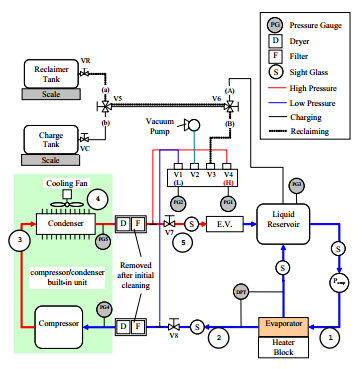 Note that the design is similar to a generic vapor compression heat pump, but the novel evaporator design involves an additional liquid loop to permit excess liquid to return to the reservoir. Figure 2. VC-HTPL schematic for the prototype tested. Figure 3. The COTS compressor used during this study was an oil-free, reciprocating piston design. [Model G5Twin by Appion, Inc.]. The working fluid used was HFC-134a. This fluid was chosen based on its compatibility with wetted materials, low toxicity and flammability, compatibility with the temperature range of interest, and its workable figures of merit for vapor transport, liquid transport, and compression factor. The configuration as tested is shown in Figure 4. Prior to a discussion on transient behavior from start-up conditions and various tilt angles, a description of the steady, nominal loop operation is provided as a standard for comparison. Figure 4. The VC-HTPL system as tested at JPL. Note the use of the test fixture to impose a slight adverse tilt. the mixture exiting the evaporator is either separated by phase or additional heating is applied to bring it to superheated vapor. the mixture is brought to saturated or subcooled liquid by either mixing in a reservoir or through additional cooling. BASIC VC-HTPL OPERATION – The specific design condition for the VC-HTPL is similar to the heat pump described above. 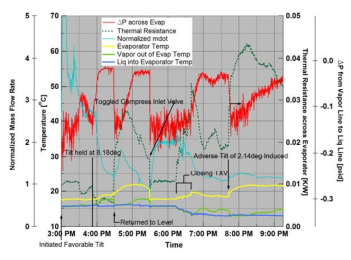 Figures 5 and 6 illustrate typical thermodynamic performance for the VC-HTPL during tests at JPL. 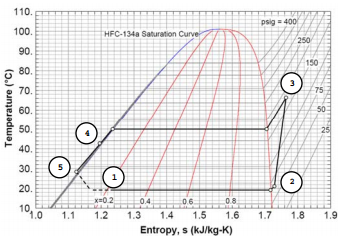 Figure 5 is a simplified, somewhat idealized, temperature-entropy diagram with the saturation curve for the working fluid, HFC-134a, shown. The circled points on each graph represent a state for which either temperature and/or pressure data exists. The point labels correspond to the locations shown in Figures 1 and 2. Label 1 in the figure is the state of the liquid prior to entering the evaporator. A portion of the flow is then superheated to state 2, which is measured just after the evaporator, several inches upstream on the vapor line. After the vapor is compressed (state 3) and subcooled (states 4 and 5), the high pressure liquid is then expanded to an unknown state of higher entropy, lower pressure, and lower temperature as shown by the dashed line. The low quality mixture then mixes in the reservoir with the liquid return flow from the evaporator. The liquid is then metered by the gear pump which feeds the evaporator. Figure 6 is the corresponding pressure-enthalpy diagram. Note that the number of pressure measurements were limited and were not generally co-located with the temperature measurements. The low pressure vapor line was one such area. The temperature measurement was made near the evaporator while the pressure measurement port was about 100 cm downstream toward the compressor. Despite the difference in the two measurement locations, the state of the fluid can be inferred and extended to also apply to the compressor inlet. The reasons for which are the low mass flow rate and near-ambient operating temperature of this line. The low mass flow rate results in negligible pressure loss, and the near ambient fluid temperature results in negligible heat transfer to the environment. Figure 6. Pressure-enthalpy states for the same steady-state performance of Figure 5.
μvap is the dynamic viscosity of R-134a saturated vapor at 16.5oC. The low mass flow rate of the vapor results in a negligible pressure drop from the evaporator to the compressor. Heat loss to the environment is also minimized because, under nominal operation, this line was run either at or below ambient temperature. 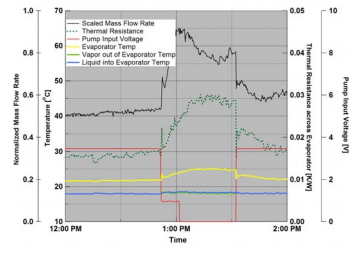 For comparison, if single-phase liquid cooling were employed with a 5oC temperature rise from evaporator inlet to outlet, the corresponding mass flow rate would be ~ 100 kg/hr. DETAILED VC-HTPL OPERATION – A more in-depth look at the VC-HTPL reveals some application-specific advantages over the generic heat pump, along with imposed restrictions in order to realize them. The evaporator promotes liquid-vapor interface boiling through an advanced, passive design. A proprietary wick structure provides passive phase separation with saturated or slightly superheated vapor exiting the evaporator. Excess liquid is returned to a liquid reservoir. Although menisci-based pumping pressure may be available from this wick structure, it does not necessarily provide the governing potential for flow due to the presence of a compressor. The compression and condensing stage are directly analogous to the standard heat pump. But thermal expansion through a thermal expansion valve (TXV) can be used to tune the fluid temperature, pressure, and flow rate entering the evaporator. This hybrid system combines passive and active technology to provide distinct advantages over both. Passive phase separation in the wick structure permits a simpler design over active phase separators or interstage heaters associated with active systems. It provides a very low thermal resistance interface between the heat source and working fluid due to thin film evaporation off of the wick. Utilization of compressor work through active TXV control provides a way to mitigate start-up issues associated with fully passive capillary systems. where the Evaporator Temp is measured on the evaporator near the heater interface, and the Vapor Temp is measured on the vapor line downstream of the evaporator exit. The ΔP of Figure 8 is the pressure differential measured between the vapor line downstream of the evaporator and the fluid inlet line prior to the evaporator. 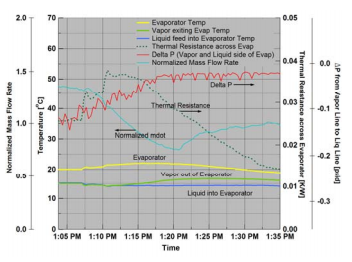 During the first two minutes of operation shown in the data of Figures 7 and 8, the evaporator is being cooled by vapor-liquid interface boiling and likely also by saturated liquid or a low quality mixture flow: the temperature of the vapor line downstream of the evaporator is the same as that of the subcooled liquid entering the evaporator. The thermal expansion valve (TXV) was then tuned to obtain slightly superheated vapor conditions by decreasing the orifice opening and thus lowering its downstream pressure and temperature. The system then stabilizes to a steady-state condition given at the end of the plots. 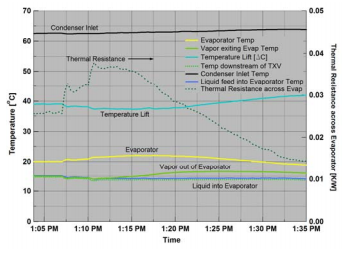 Figure 7 shows the minimum thermal resistance is obtained at this time (1:35pm) where stable liquid-vapor interface film boiling is occurring in the evaporator. And the normalized mass flow rate plotted in Figure 8 indicates near-optimum conditions with a value near unity. The ΔP between the vapor space and liquid side of the evaporator increases as the system progresses from an initial state of having liquid exiting the evaporator to the final state of slightly superheated vapor at the exit. The final ΔP value of about -0.02 psid thus corresponds to a state where the generated vapor is of pressure sufficient to offset the compressor suction pressure from exceeding the capillary limit of the wick. The data at the beginning of the run shows smaller ΔP values which were indicative of an unfavorable pressure differential which was unable to prevent liquid from being forced out of the wick structure into the vapor line. 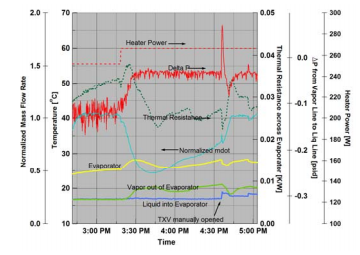 Note the effect of reducing the TXV orifice opening, done to promote the slightly superheated vapor condition, has the effect of lowering the evaporator pressure toward achieving a favorable ΔP. Figure 8. 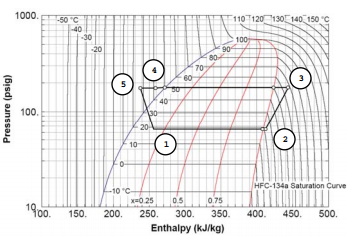 Pressure difference between the exit vapor pressure and inlet liquid pressure for the evaporator along with the normalized mass flow rate are shown for the same case in Figure 7.
high coefficient of performance (COP). Despite the lack of a properly sized compressor, the data gathered suggests that to permit optimal performance, suction pressure cannot be so great as to overcome the vapor pressure and exceed the capillary limit of the wick structure. a dry-out condition for the evaporator wick with superheated vapor being generated. 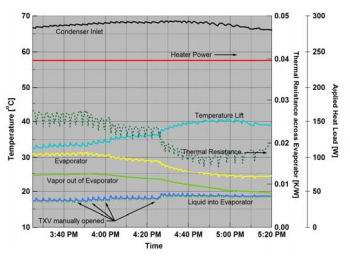 USING THE TXV TO RECOVER FROM A FLOODED CONDITION – If the evaporator starts from a flooded condition and the flow rate of the incoming liquid is too high for the given heat load, insufficient evaporation will occur and liquid will enter the vapor line downstream of the evaporator. Lifting of the evaporator heat load is likely accomplished through a mixture of both single phase convection and thin film boiling. Such a state can be brought to optimal conditions by reducing the TXV opening to lower the liquid side pressure of the evaporator. This also has the effect of decreasing the evaporator liquid temperature. Figures 9 and 10 show data for a case where the TXV was manually adjusted until the optimal condition of slightly superheated vapor in the vapor line was achieved. Figure 9. Key temperatures and thermal resistance values starting from a case with a flooded vapor space and then reaching optimal conditions through manual TXV adjustments. Figure 10. 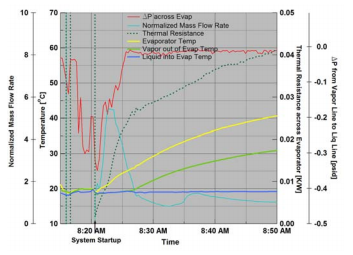 ΔP between the vapor and liquid side of the evaporator and normalized mass flow rate are shown for the same period as in Figure 9. From the period between 6:17pm and 6:40pm in Figures 9 and 10, the TXV was manually closed to lower the evaporator saturation pressure and temperature. The mass flow rate also decreased as a result. Once sufficient vapor was generated in the evaporator to support enough ΔP to prevent exceeding of the wick capillary limit, the vapor space was cleared of liquid and instead contained slightly superheated vapor. Note that during this transition, the evaporator temperature increases despite a lower liquid inlet temperature. It then returns to the colder condition once steady-state operation is reached. An interesting difference can be seen in the thermal resistance trend of this case when compared to that of Figures 7 and 8. 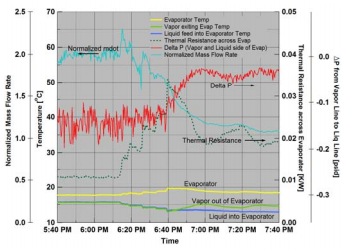 Figure 10 shows that the thermal resistance across the evaporator was relatively low despite a flooded vapor region downstream of the evaporator (5:40pm to 6:15pm). That the mass flow rate is relatively large during this period suggests that cooling is being accomplished, at least in part, by liquid convection. Another scenario supported by the data is that most of the evaporator is actually being cooled by liquid-vapor interface boiling and that some additional liquid is being pulled into the vapor region due to the adverse ΔP. The rationale behind this theory is that the low thermal resistance achieved is not possible if dominated by convection, despite the higher mass flow rate. The additional liquid being pulled into the vapor region can only come from the reservoir via the inlet flow line or the liquid return line. The fact that the feed pump regulates the liquid inlet flow to the evaporator would mean that any fluid pulled into the vapor region from this line would result in less fluid being supplied to the wick. 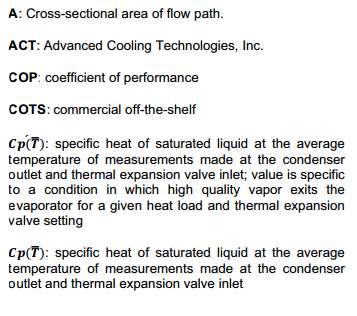 So it follows that this does not appear to be the dominating source of liquid into the vapor space because of the low thermal resistance across the evaporator: a partial dry-out condition would likely occur which would raise the evaporator temperature. A more plausible scenario is that liquid is being pulled into the vapor space from the liquid return line. Inspection of the sight glass in this line appears to show this to be the case, but it could not be confirmed due to the difficulty in viewing this flow. Maintaining a minimal evaporator temperature for a given set of conditions may be seen as the ultimate goal of this thermal control system. That this temperature was nearly the same for the flooded condition at the onset of this test as for the final condition leads one to consider the system robust in terms of achieving this goal from multiple operating modes. But the final state of slightly superheated vapor is really the only acceptable mode, assuming that any compressor used for the VC-HTPL is susceptible to long term damage when exposed to liquid at the inlet. These tests showed that active TXV control is one method of achieving this optimal condition. USING THE TXV TO RECOVER FROM A DRY-OUT CONDITION – If the system is operating with excessive expansion across the TXV, the system will equilibrate to a dry-out condition. The reduction in fluid-side evaporator pressure will mitigate suction pressure from drawing liquid into the vapor line. Film boiling is then promoted with this favorable ΔP, but the additional heat leak into the system due to the lower inlet fluid temperature, in addition to the higher quality, lower pressure mixture after the expansion, will result in insufficient liquid available to support the given heat load. A moderate form of a dry-out condition is shown in Figures 11 and 12 up to 3:47pm. Figure 11. The system is shown to recover from a dry-out condition by manually opening the TXV valve. Note that oscillations are early signs of a broken condenser fan. Figure 12. Additional data corresponding to the scenario of Figure 11. Note that the lack of sufficient fluid to support the heat load results in a reduced mass flow rate through the two phase loop and an increased liquid flow rate in the return loop. The normalized mass flow rate is less than unity. The ΔP measurement across the vapor-side to liquid-side of the evaporator is consistently high enough to mitigate compressor suction pressure. After 3:47pm, the TXV was manually opened which increased the evaporator’s inlet fluid temperature but lowered the temperature and thermal resistance across the evaporator itself. The system was then brought into optimal conditions, but proceeded to go towards a saturated condition because the TXV was opened slightly beyond optimal. Consequently, the ΔP reading started to trend downward and the thermal resistance started increasing after reaching a minimum. The system was stopped prematurely and did not permit verification of the mass flow rate recovery. A faulty condenser fan used to cool the high pressure vapor resulted in this shutdown of the system. The oscillations in several of the plots of Figures 11 and 12 are early indications of the fan malfunction. It was previously shown how the TXV can be adjusted to recover from a flooded vapor line. Closing the TXV results in a lower liquid-side evaporator pressure and temperature and a higher quality mixture entering the reservoir. A favorable ΔP across the evaporator results in the clearing of liquid in the vapor line. But it is also possible to recover from a flooded vapor line by increasing the heat load on the evaporator. Figure 13 shows how an increase in heat load at 3:17pm resulted in the generation of superheated vapor. Inspection of the vapor line sight glass downstream of the evaporator confirmed the presence of liquid before this time and the clearing of all liquid by 4:00pm. Figure 13. A saturated state with liquid in the vapor line can be cleared by the application of supplemental heat. When the above scenario was re-tested a few days later with similar settings, a different condition was obtained for the initial state of a flooded vapor line. 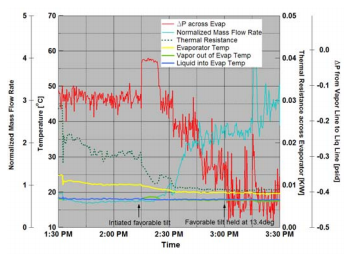 Although the evaporator temperature and ΔP across the evaporator were similar, the mass flow rate was much higher and much less liquid was noticed in the vapor line sight glass at 9:21pm prior to the increase in heater power (see Figure 14 and 15). Figure 14. An analogous case to that shown in Figure 13 was re-run with similar parameters on a later date and are shown here. Figure 15. Additional data plotted for the case of Figure 14. Note the large difference in normalized mass flow rate when compared to similar conditions as the case plotted in Figure 13. The difference between the two tests is related to their difference in history leading up to this point. The test for which data is shown in Figure 13 up to about 3:15pm is analogous to previous examples of a flooded vapor line. But the test case shown between 9:00pm and 9:20pm in Figures 14 and 15 is markedly different. The normalized flow rate, derived by using the temperature losses across the high pressure liquid line and an estimated heat loss, is extremely high. The reason for this is due to having vapor in this region, as confirmed by sight glass inspection. The mass flow rate is high enough where the condenser can no longer subcool the vapor exiting the compressor. The high quality flow then maintains the high pressure liquid line at a constant temperature as it condenses. This results in an unrealistically high value for the derived mass flow rate. Notwithstanding, the actual flow rate remains well above that of the scenario in Figure 13. The difference may be explained based on the start-up history and previous use of an adverse tilt on the evaporator which occurred prior to the time plotted in Figures 13 and 14. A more detailed explanation of this effect will be given in the next section. The liquid feed into the evaporator is regulated by the pump speed, which was kept equal and constant for both cases. The much larger mass flow rate seen for the latter case resulted from additional fluid draw from the liquid return line. 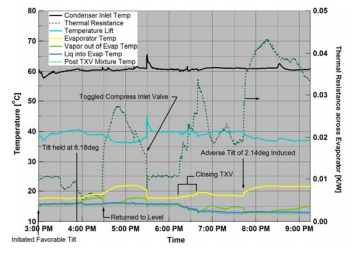 When the supplemental heat load was applied, the evaporator temperature and thermal resistance increased beyond that which was seen in the former case of Figure 13. This was possibly due to the excess amount of liquid in the vapor line which required more time to clear. The influence of gravity gradients on the operation of the VC-HTPL was necessary to gain a better understanding of the system. Future applications on the lunar surface require that gravity effects be well understood. Work was done to examine VC-HTPL operation as configured in Figure 4 when subjected to adverse and favorable tilts. Tilts were induced by rotating about the Y-axis. 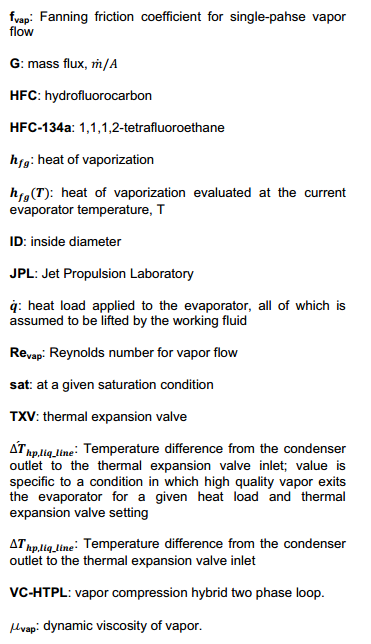 In the context of these specific tests, a favorable tilt is considered one in which the evaporator is tilted below the exit vapor line. An adverse tilt is one in which the evaporator is tilted above the exit vapor line. EFFECTS OF A FAVORABLE TILT – The effect of a favorable tilt can, upon first thought, be expected to enhance VC-HTPL operation. It would be expected to enhance wetting of the wick (for this specific evaporator design) and slightly negate the detrimental effect of compressor suction pressure on the capillary limit by providing a small gravity force. 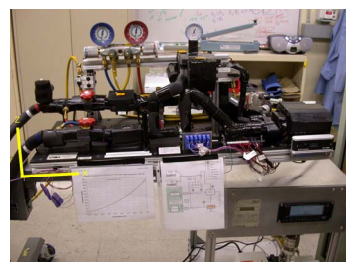 A set of tests were conducted on the system for favorable and adverse tilts at varying heat loads and TXV settings. Figures 16 and 17 show data from one such test which were somewhat typical of operation. Figure 17. Additional test data for the same case shown in Figure 16. Starting from a level condition where the vapor line was flooded (Condition 3 in Table 1), from 3:00pm to 3:50pm a favorable tilt was induced. A tilt of about 8.2o was required to generate sufficient pressure to offset the compressor suction and allow the generation of slightly superheated vapor into the vapor line. The system was allowed to reach steady-state at 4:25pm. Thermal resistance was at a minimum and the normalized mass flow rate was near unity. But when the system was returned to level at around 4:26pm, data suggests the vapor line became immediately flooded again: the vapor line temperature dropped to the saturation temperature and ΔP dropped to levels which are beyond the capillary limit. This was confirmed by sight glass readings which showed two-phase flow in the low pressure vapor line. The evaporator temperature did not return to pre-3:00pm temperatures, however, and instead continued to increase. One explanation is that the superheated condition which was induced by the favorable tilt is still in effect when initially re-leveled. Liquid was thrown into the vapor line due to the sudden leveling which results in a lower vapor pressure and temperature in the vapor line. The capillary limit was then exceeded which allowed liquid to be drawn into the vapor line. Essentially, the evaporator is believed to have continued to increase in temperature due to a reduction of flow through the wick structure. Provided the wick is not completely void of liquid, this condition should be temporary and conditions should return to those which existed prior to inducing any tilt at 3:00pm. The system was showing signs of recovering to this state after reaching a peak evaporator temperature at 5:00pm. The evaporator temperature started trending downward which coincided with the high ΔP level and decreasing levels of liquid in the vapor sight glass. The upset caused by the re-leveling resulted in a transient. The transient condition exists until the vapor line can again be cleared. The wick would then be expected to draw in more liquid and gradually reduce the evaporator to previously existing saturated or subcooled conditions. At about 5:30pm, the vapor sight glass was clear of any liquid and the normalized mass flow rate was near unity. Although the evaporator and vapor line temperatures were still trending downward, it was decided to investigate whether the return to a saturated/subcooled evaporator condition could be expedited. The slow trend downward was presumably being caused by the slow migration of liquid back into the wick structure along with the thermal mass of the system. To hasten this process, the compression suction pressure was momentarily reduced by closing the compressor inlet valve for a few seconds. This allowed the wick structure to become flooded again and return to a saturated/subcooled evaporator. More work is recommended in this area to verify transient performance. Namely, the passive return to pre-tilt conditions may not always occur. Although it was trending toward recovery in the test data shown, it is not certain whether system states are truly unique for a given configuration or if multiple states can exist depending on past history of use. An area which requires further discussion is the change in mass flow rate during this period. Similar to that of other quantities, the magnitude of such change is subtle but is significant in an understanding of system dynamics. When the system was re-leveled at 4:26pm, the normalized mass flow rate started increasing. But the wick continued to generate slightly superheated vapor and was fed a near constant flow rate at its liquid inlet port via the gear pump. The source of fluid allowing for the increased flow appeared, by sight glass inspection, to be coming from the reservoir via the liquid return line. To confirm this, a test was performed where the gear pump was momentarily powered off which effectively closed this flow path. Figure 18 shows an initial condition of a flooded vapor region (Condition 3 of Table 1) with nominal pump voltage of 3.5V applied. Figure 18. To investigate possible reverse flow through the Liquid Return line, the pump was turned off during a flooded vapor line condition [heat load = 220W throughout test]. At 12:48pm, the pump voltage was reduced and then turned off entirely at 12:58pm. During this time, the normalized mass flow rate increased, yet the evaporator temperature also increased. Sight glass inspections at 1:25pm showed little to no flow going to the pump and what appeared to be a significant flow from the reservoir toward the evaporator via the liquid return line. The evaporator temperature is higher due to a presumably less effective wetting flow than compared to the liquid inlet line. This data confirms that reverse flow is possible through the liquid return line and suggests that it is less restrictive than flow through the liquid inlet line. The increased thermal resistance also suggests that feeding the evaporator in this manner is less effective at managing the thermal load. Of course, this is not unexpected since the evaporator is not designed to operate in this mode. The possibility of reverse flow through the liquid return line may help explain why an extreme favorable tilt can cause more extensive flooding in the vapor line than what originally existed prior to imposing the tilt. Figure 19 shows the results of starting from a leveled system in a flooded condition. At 2:14pm, the system was gradually tilted in steps and reached a peak of 13.4otilt at 3:00pm. Note the initial generation of superheated vapor at 2:20pm. However, as the tilt is increased, the vapor line again receives two-phase flow, the ΔP across the evaporator drops, and mass flow rate increases. The thermal resistances is low due to full wetting of the wick. Some flow was noticed to be flowing toward the evaporator through the liquid return line, but the flow was relatively small. Figure 19. The effect of an extreme favorable tilt on the system resulted in a flooded vapor line [heat load = 240W]. EFFECTS OF AN ADVERSE TILT – Based on the data previously presented, the effect of an adverse tilt is expected to result in poorer performance. Specifically, the capillary limit of the wick structure will be at a further disadvantage and made more susceptible to compressor suction. 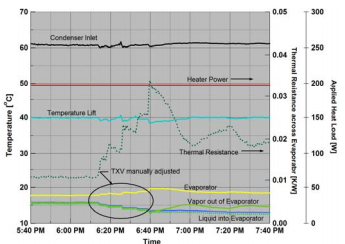 Again referring to Figures 16 and 17, the TXV was manually adjusted to obtain optimal conditions of slightly superheated vapor in the vapor line (6:11pm to 6:39pm). After allowing the system time to better stabilize, an adverse tilt of 2.1o was imposed at 7:42pm. The ΔP immediately dropped, indicating the introduction of two-phase flow in the vapor line. The mass flow rate increased slightly, but the change was not as extensive as in the case of re-leveling from a favorable tilt of 8.2o described earlier. The increased evaporator temperature and thermal resistance shows that an adverse tilt results in poorer heat transfer. 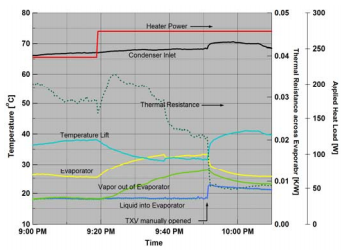 Comparison of similar states with the same heat load, TXV setting, liquid inlet temperature, and exit vapor temperature at 7:15pm and 8:45pm of Figure 17 show a higher evaporator temperature and thermal resistance when an adverse tilt is imposed. A set of tests were performed to investigate whether a given state for the system (i.e., TXV setting, applied heat load, pump input voltage, system tilt angle) results in consistent performance, independent of startup conditions. Previous work done by Park(1), et al., showed differences in performance based on the immediate history of the system. The presence of nucleate boiling upon startup of a flooded evaporator was shown to result in a higher thermal resistance until the vapor space could be cleared. Although similarities exist between this system and the previous HTPL, the presence of compressor suction pressure in this VC-HTPL system provides more flexibility in terms of clearing the vapor space of the evaporator. However, similar concerns apply for the ability to clear the vapor line after the evaporator. To exemplify this concern, test data is presented in Figures 20 and 21. A day of testing ended with the system placed in an optimized state (State 4 in Table 1). The system was placed in a favorable tilt with 240W of heat load applied to the evaporator. The system was allowed to reach steady-state prior to shutting down the system. 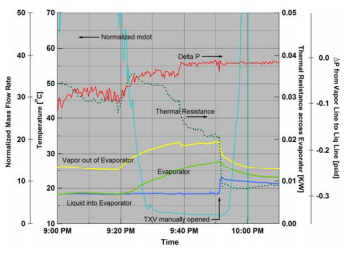 The final steady-state of performance is shown in Figure 20 after 8:10pm: slightly saturated vapor exists in the vapor line; thermal resistance is low; mass flow rate is also low. The working fluid was then reclaimed and the system was left under vacuum until the next morning. Figure 20. The system was placed into an optimized mode with a given TXV setting, system tilt, and 240W of applied load. Figure 21. For the same parameters as used at the end of testing shown in Figure 20, the system was drained, recharged, and started on the subsequent morning. The following day the system was re-charged with the same amount of working fluid as was used to charge the system the previous day. All settings were kept identical to the previous night’s test and the same heater power was applied. Figure 21 shows the resulting performance upon startup. The evaporator temperature increased rapidly and a dry-out condition existed on the wick. Although the flow rate was higher than that on the previous day, the majority was bypassing the wick due to the low ΔP which initially exceeded the capillary limit. The initial presence of liquid in the vapor line on day 2 was likely the cause. 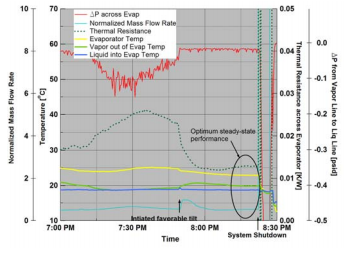 But the system was expected to recover after 8:27pm when liquid was presumed to have been cleared from the vapor line, as indicated by the high ΔP and low mass flow rate. Although the system may have recovered after some time, the TXV was opened to prevent the evaporator temperature from exceeding its temperature limit. The testing and subsequent analysis of data done on the prototype VC-HTPL system was extensive over a wide domain of operating conditions. Although the differences in details described are subtle and appear to be somewhat esoteric, they provide invaluable information to aid in the understanding of system dynamics. The conclusions and recommendations gained from this study will be used as feedback into the next generation prototype with an improved design. Items 4 and 6 are dominated by the specific compressor used. Since this study did not involve the design of a custom compressor, system parameters were not varied toward achieving these criteria. The compressor was run at constant input voltage and was not adjusted throughout this study. That it was oversized for this VC-HTPL prototype resulted in behavior that may not be as extreme given a more tailored compressor. For the configuration tested, the compressor provided a high level of suction pressure which mitigates pool boiling issues at startup, but at the expense of making forced convection boiling more difficult. The results presented showed what appears to be several steady-state and transient modes which can result depending on the system settings, applied heat load, tilt angle, and previous state. Although many gray areas exist, the basic modes of operation can be summarized to include four main states. These are described in Table 1. State 1a: Extreme worst case condition where flow from the liquid return line largely bypasses the evaporator wick and enters the vapor line. The wick experiences a dry-out condition. The normalized mass flow rate is extremely high due to the less resistive flow path which bypasses the gear pump. The system equilibrates into a two phase flow throughout with the wick largely bypassed. The condenser is unable to subcool the compressed vapor due to the high flow rate. The quality exiting the TXV is higher due to the increase in entropy. Additional heat is picked up from the evaporator and environment, increasing the quality further. In terms of the optimal performance characteristics, State 1a is a worst case scenario. measured from the exit vapor line to the inlet liquid line. State 1b: There may be varying degrees of State 1a where the dynamics result in a different proportion of flow going through the pump path. Both cases 1a and 1b are the result of wrong-way flow through the liquid return line. Scenarios where larger heat lifts are required at the evaporator tend to be more susceptible to this mode. It was shown that State 1 may result if a high heat load is applied upon startup with a flooded vapor line. State 2: This is a transient state where it was shown possible to have superheated vapor in the evaporator core due to partial wick dry-out. Dry-out was due to an unfavorable ΔP across the evaporator which exceeds the capillary limit thus drawing liquid into the exit vapor line. The normalized mass flow rate tends to be higher than unity due to partial cooling via single-phase liquid. This state was seen to occur as a transient due to a sudden change in conditions such as in response to an adverse tilt. The sudden reduction in exit line vapor pressure due to sudden throwing of liquid can cause the flow dynamics to change and starve the wick. The system recovers back to the more benign state from which it started once the liquid line is cleared. 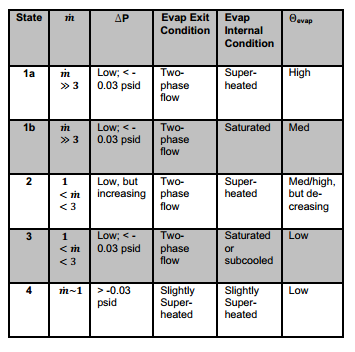 State 3: Near optimal conditions can exist in terms of maintaining a minimal thermal resistance across the evaporator despite the introduction of liquid into the exit vapor line. It was shown that an unfavorable ΔP can result in the capillary limit being exceeded, but that wick dry-out does not occur. Such a scenario can occur if the TXV is opened extensively and/or too low a heat load is applied. If the TXV opening is extremely large, the resulting high saturation temperature, pressure, and flow rate would not allow liquid-vapor interface film boiling and evaporator cooling is through single phase convection. Note the system could go into a State 2 scenario from State 3 if a sufficiently high heat load is suddenly applied. State 3, while acceptable in terms of maintaining an acceptable thermal resistance across the evaporator, is not acceptable in terms of the introduction of two-phase flow at the compressor and less than optimal in terms of a higher flow rate. State 4: This is the intended mode of operation for the VC-HTPL where slightly superheated vapor exits the evaporator and high quality vapor is made available to the compressor. The suction pressure is offset by a sufficiently high ΔP across the evaporator such that the wick capillary limit is not exceeded. 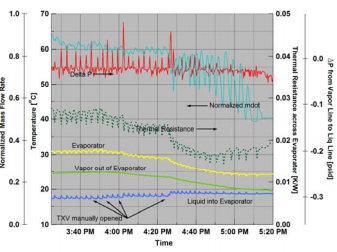 This study showed that recovering from a less-than-optimal state to State 4 can often be accomplished by adjusting the TXV to make use of the compressor work being put into the system. Although this would, to some extent, define the operating temperature of the VC-HTPL, the amount of control is relatively great for a small temperature difference. Also, advanced wick designs and optimization of working fluid selection can also provide a wider range of control. the use of a feed pump may not be required if a method is found to properly utilize compressor-based pumping. The development described in this paper was carried out at the Jet Propulsion Laboratory, California Institute of Technology, under a contract with the National Aeronautics and Space Administration. The authors express their thanks to Ryan Stephan, Project Manager, Advanced Thermal Technology Project, Exploration Technology Development Program for his support and guidance on future lunar mission requirements. Our gratitude also goes to Jon Zuo of Advanced Cooling Technologies for his suggestions and guidance with the manuscript. The authors would also like to thank Mr. Jeff Reichl of Advanced Cooling Technologies and Mr. Robert Uyeda at the Jet Propulsion Laboratory for their contributions in building and integrating the prototype system and support equipment. Park, Chanwoo, Aparna Vallury, Jon Zuo, Jeffrey Perez, and Paul Rogers. “Spacecraft Thermal Management using Advanced Hybrid Two-Phase Loop Technology,” Space Technology and Applications International Forum, Albuquerque, New Mexico, February 2007. Park, Chanwoo, Aparna Vallury, Jon Zuo, Jeffrey Perez, and Paul Rogers. “Electronics Thermal Management using Advanced Hybrid Two-Phase Loop Technology,” HT2007-321962, American Society of Mechanical Engineers ASME-JSME Thermal Engineering Summer Heat Transfer Conference, Vancouver, British Columbia, Canada, July 2007. Park, Chanwoo, Eric Sunada. “Vapor Compression Hybrid Two-Phase Loop Technology for Lunar Surface Applications,” Space Technology and Applications International Forum, Albuquerque, New Mexico, February 2008. McQuiston, Faye C., Jerald D. Parker, Heating, Ventilating, and Air Conditioning: Analysis and Design, 2nd edition, John Wiley and Sons, New York, NY, 1982. Howell, Ronald H., Harry J. Sauer, Jr., William J. Coad, Principles of Heating, Ventilating, and Air Conditioning, American Society of Heating, Refrigerating and Air-Conditioning Engineers, Inc., Atlanta, GA, 1998. Owen, Mark S. ed., 2005 ASHRAE Handbook: Fundamentals, American Society of Heating, Refrigerating and Air-Conditioning Engineers, Inc., Atlanta, GA, 2005. Eckart, Peter, ed., The Lunar Base Handbook, The McGraw-Hill Companies, Inc., New York, NY, 1999. Carey, Van P., Liquid-Vapor Phase-Change Phenomena, Second Edition, Taylor and Francis Group, New York, NY. 2008. Gabriel, Kamiel, Microgravity Two-Phase Flow and Heat Transfer, Microcosm Press, El Segundo, CA, 2007.